TV Pilot Episode About US! LOGB Made it to TV! Thanks To Bob Anderson with Red Willow Films as well as the new TV show Eco Company, who recently found us through our blog, decided to pilot his new TV show with an Episode all about us!!! So we put five pieces in this fashion show to raise money for Zero Breast Cancer last night and it went great, so many people showed up and everyone was very enthusiastic. Four of the pieces were the same as the ones in the Turning Green Show in New York but we had one new outfit that is to die for and has to be our absolute favorite. here is a picture of our new outfit from the show! Pretty things from a recent trip that make our hearts swoon. Just thought to mention it, as a good mood is filling this bubble over near L.O.G.B. We have a fitting for the Breast Cancer Awareness show today. 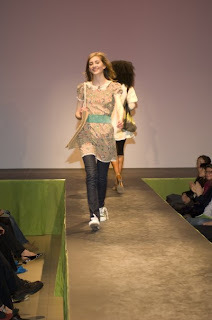 On April 4, 2008 In New York City at the Broad Street Ballroom (41 Broad Street) four of our designs will be featured on the runway along with 99 other eco-designers in an act of using recylced, reused and organic fabrics to help our world live a longer, healthier and more fashionable life. Come see the Turning Green: A New Way of Life Fashion Show hosted by Zem Jaoquin and Erin Schrode. On May 2, 2008 in Mill Valley, California at Tamaplias High School (Our Highschool) the breast cancer awareness club is putting on the Choose To Fight for Breast Cancer Fashion Show. Five of our designs are being featured in the show. It is going to be a great event that is completely put together by Tam High Student, so come check it out! We are Josy and Aza, the founders and designers of Left Over Green Beans. We are two girls who grew up together dreaming of having our clothes published in magazines such as Vogue and W. Now, 15 and 16 years of age we are embarking on a journey we have been fantasizing about since we learned to draw and sew. This blog will trace the adventures of Left Over Green Beans, Aza, Josy, and all the people we will meet in between. The Leftover Green Beans line is completely made from vintage materials such as leftover vintage fabrics, hand crocheted curtains, deconstructed clothing, and hand-made trims. Josy Hamren and Aza Ziegler, friends who have grown up together, find pieces that they love in flea markets and grandmothers' closets and put them together to create totally unique garments. Theirs is a dynamic creative process full of surprises and discovery. And although the pieces come from many sources their shared vision results in a line that is unmistakably "Josy and Aza".